If you’ve never heard of the Malay dish nasi beringin, I don’t blame you. 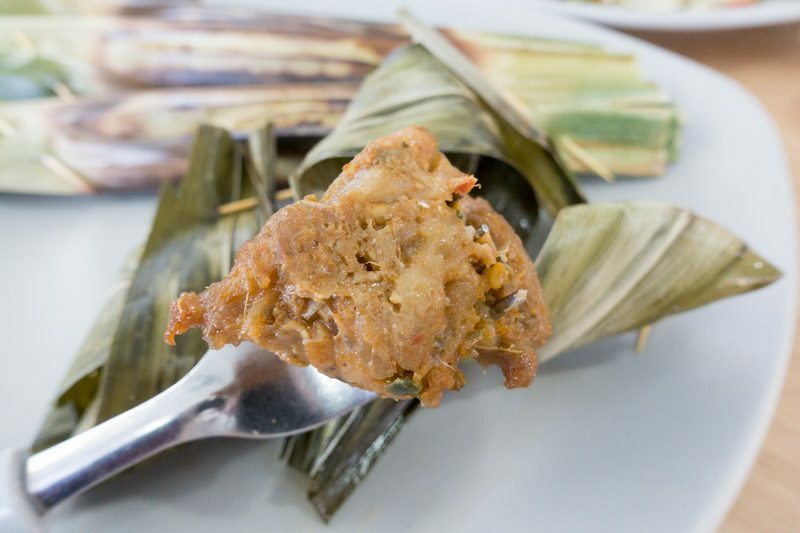 It used to be served to Johor Bahru royalties in the late 1890s; the sultans would have this fragrant dish especially when guests were invited to dine in the palace. 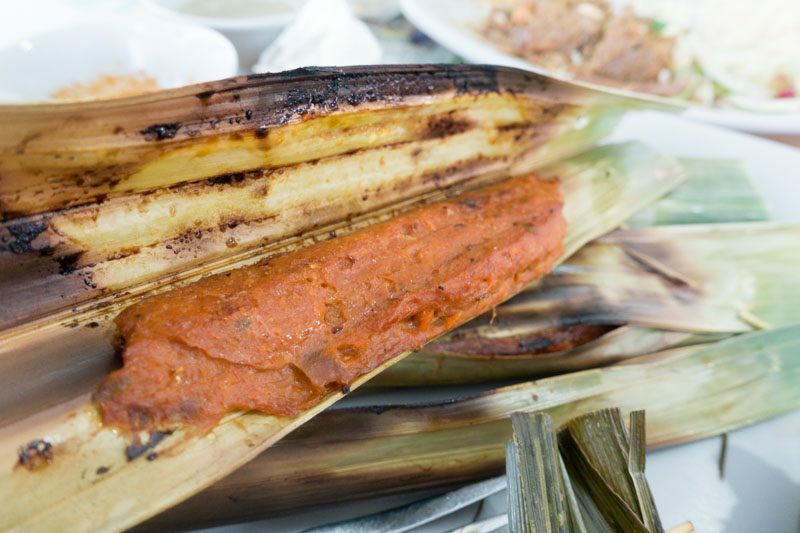 Fifty50 Empire, helmed by Fahmi Rahaman and Afnan Khairul, have finally brought this traditional dish to Singapore and it’s right here in Yishun Park Hawker Centre! Also known as nasi bering harum, which is translated to “fragrant beringin rice”, this traditional dish is best described as a blend between nasi briyani and nasi lemak. When we spoke with Fahmi, he casually joked that even his Chinese customers thought that its rice tasted like chicken rice. So, what is nasi beringin? It’s a dish comprising soft, fluffy and fragrant short grain basmati rice that’s cooked with ginger, pandan leaves and lemongrass (no wonder Chinese customers thought it was chicken rice). 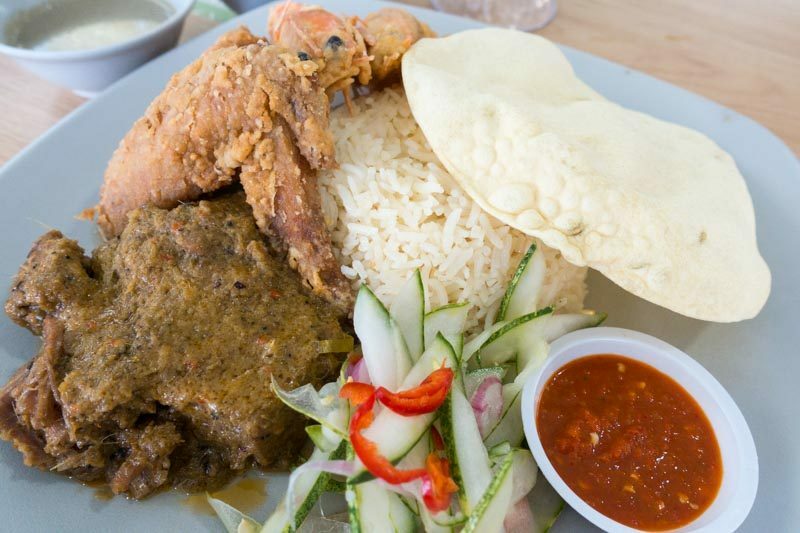 It is served with traditional offerings, such as fried chicken, juicy beef rendang, prawns, achar and sauces like masak merah, rendang and kurma. I’ve got to say, I’m super impressed with Yishun Park Hawker Centre. All the seats were widely spaced apart and there were tables specially catered for wheelchairs, so there was none of that squeezing with the hawker centre crowds. 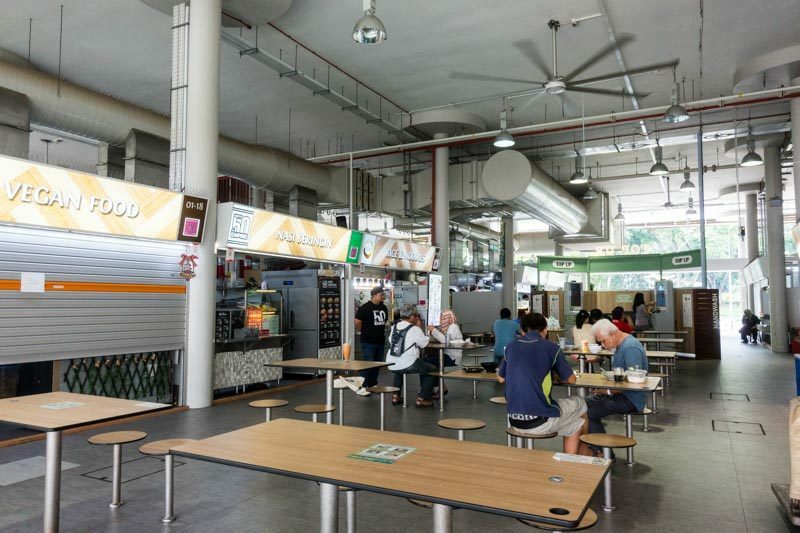 Plus, huge ceiling fans and the bright open space made the entire hawker centre really breezy despite it being a hot day. I ordered the Beef Rendang Nasi Beringin (S$5), and topped up my plate with two add-ons: Chicken (S$2) and Prawn (S$3). 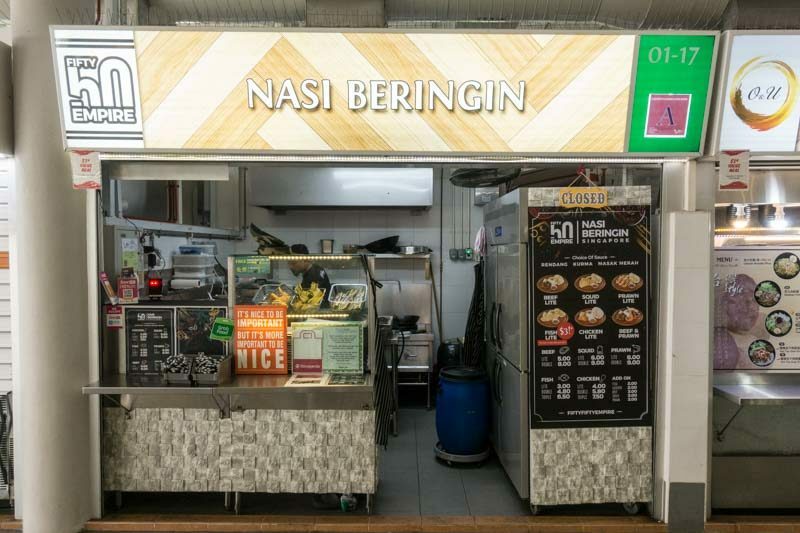 For those who’d like to simply indulge in a plate of fried chicken wings or crispy prawns with your nasi beringin, you can also try its Chicken Nasi Beringin (S$4 for Lite – one piece, S$5.80 for Double – two pieces, S$7.80 for Triple – three pieces) or Prawn Nasi Beringin (S$6 for Lite – three pieces, S$9 for Double – six pieces). 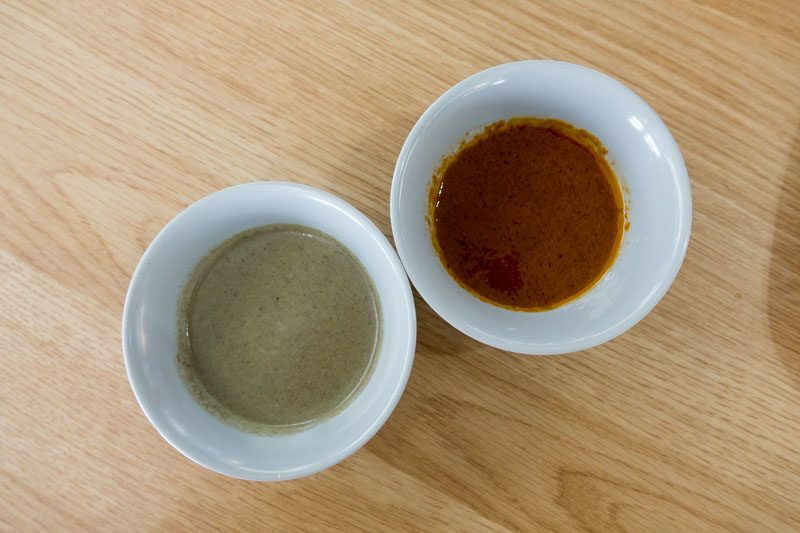 It also comes with a choice of one out of three sauces. Since I ordered the Beef Rendang Nasi Beringin, I wasn’t served the rendang sauce, but instead the kurma and masak merah sauce. Fahmi told me that though its menu only specified a choice of one sauce, they will be more than happy to give customers all three upon request. What I really enjoyed about its rice was that it was so fragrant and light. It wasn’t oily and had and a tinge of coconut. I wolfed down spoon after spoon of this fluffy rice without even feeling jelak. Instead, the lemongrass whets my appetite and I was ready to eat more. 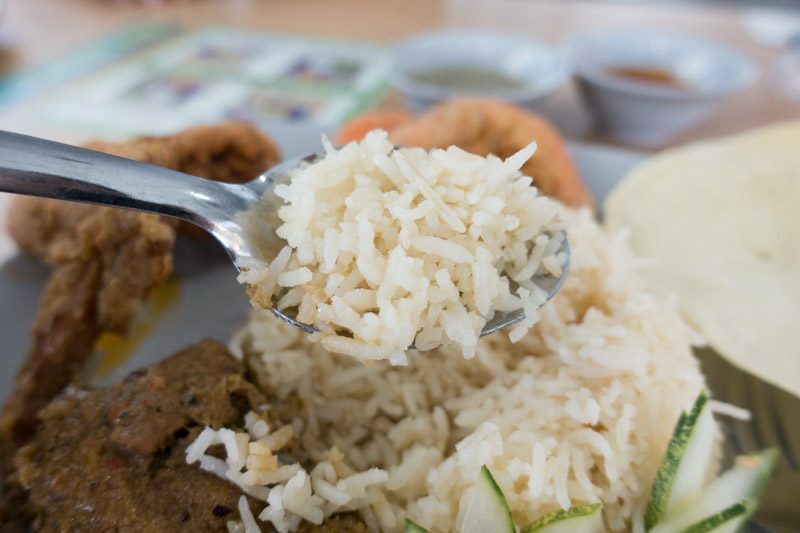 Fahmi explained that they used short grain basmati rice to differentiate their nasi beringin from other dishes like nasi briyani, which uses long grain basmati rice; and nasi lemak, which uses steamed coconut white rice. He also joked that many of his customers come just for the rice, and he’s also more than happy to provide extra servings of it upon request. The beef had been braised for four whole hours and only combined with the rendang sauce minutes before serving, ensuring that the meat retains its original sweetness without drying out. True enough, the beef rendang fell apart easily and reminded me of pulled beef briskets, in the way that they are super soft and filled with fatty layers, but still charred and firm on the outside for that smoky punch. I loved it that the beef rendang was slightly peppery as well thanks to its thick piquant sauce, and I could taste strong hints of turmeric and coriander. Moving onto my favourite component of this dish: the chicken wings. 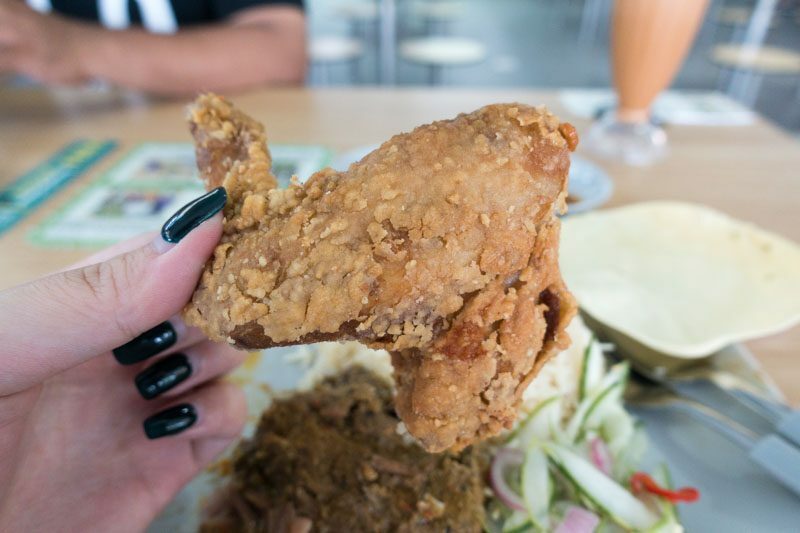 I was surprised to discover that the chicken wings weren’t overly oily, and Fahmi quickly revealed that it’s because they make their own flour batter to coat the chicken wings. Oddly enough, the taste of the crispy chicken wing skin reminded me of fried sotong head sticks. It was light and slightly salty, with a slightly nutty flavour. 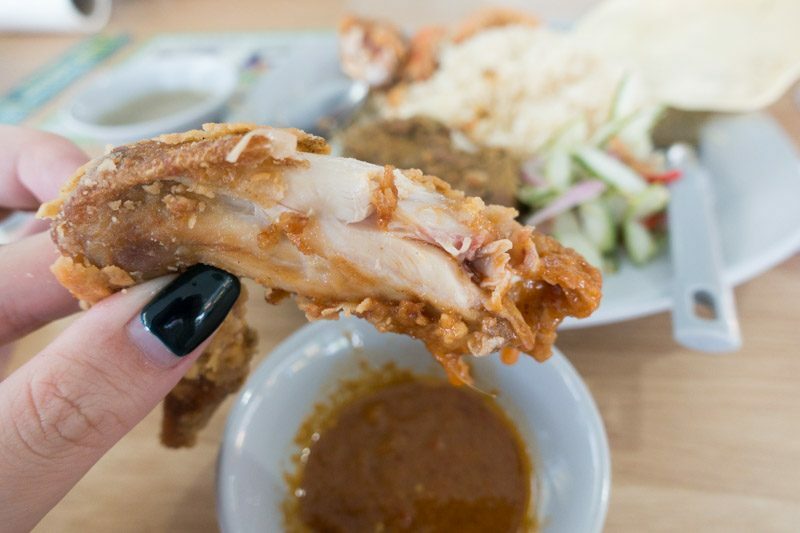 I suggest dipping the chicken wing into the masak merah sauce, a curry-based sweet sauce that’s made traditionally with tomatoes, turmeric, cinnamon and star anise. The chicken wing meat itself was soft and tender and I polished off the entire wing leaving the bones completely clean. I was pleasantly surprised at how moist it was considering it had been deep fried in batter — a huge plus point in my opinion. The masak merah sauce reminded me of the kind of curry you’d get with roti prata, but I thoroughly enjoyed dipping my chicken wing in the sauce. It wasn’t spicy but instead, slightly sweet, and went hand in hand with the chicken. The prawns were huge! 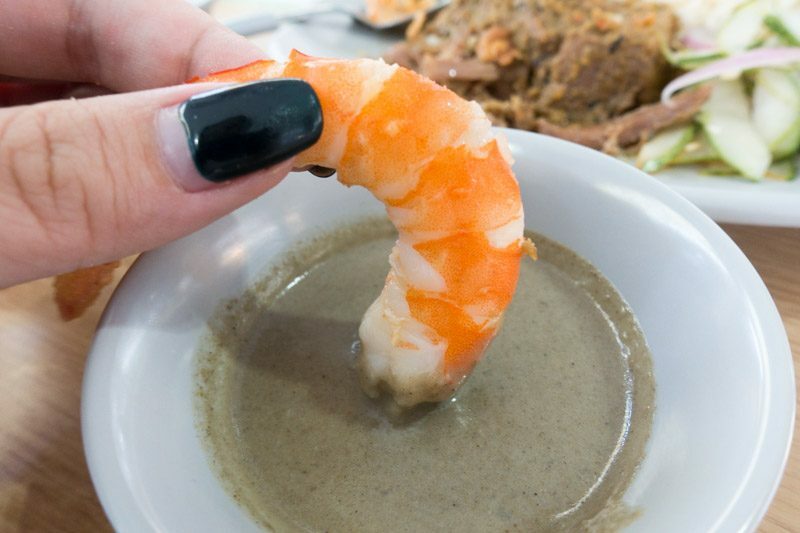 I loved it that the prawns had been deep fried in batter too, so what you’ll get is a gritty, sandy-like texture, coupled with a slightly salty and nutty aftertaste. Though you can eat the prawns whole, I chose to de-shell them so I could taste how fresh the meat was. It was firm, succulent and super sweet. I dipped the prawns in the kurma sauce, which is a coconut-based sauce that tastes strongly of cumin, lemongrass and cinnamon. It was incredibly refreshing and appetising, and complemented the sweetness of the prawns. One thing I really loved about this dish was the achar. 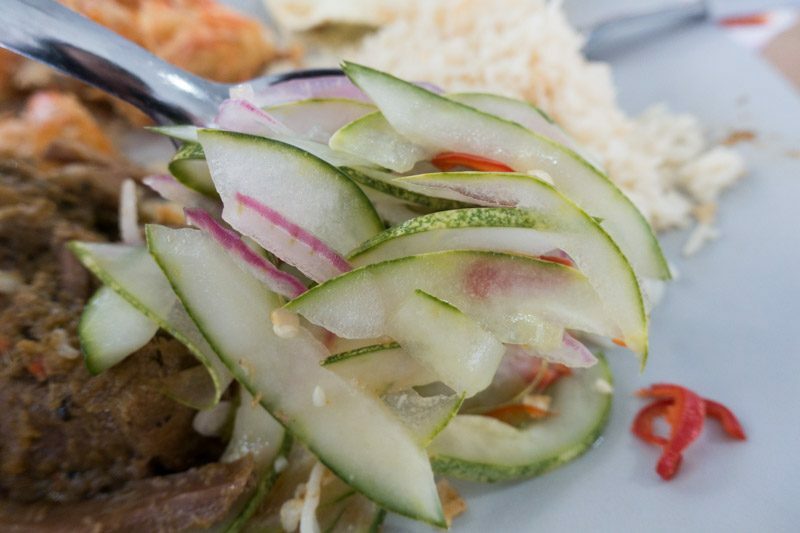 It was piquant and vinegary, with a slight tinge of heat from the chilli slices and the onions, while still being refreshing thanks to the cool thin slices of cucumber. I alternated a bite of achar with the meat and seafood, as it helped to cleanse my palate and whet my appetite. The dish also came with a large piece of pappadum, which turned soft towards the end of my meal, so I suggest eating this first. If you’re an otah fan, Fifty50 Empire also sells otah (1 for S$0.60, 10 for S$6) that doesn’t use any flour at all. Instead, what you get is a concentrated mass of pure fish meat that’s been blended with an aromatic blend of spices and herbs. I really loved the otah because of how authentic it tasted. Unlike the regular paste-like consistency you get with most otahs, the ones here were bouncy, firm and sweet. 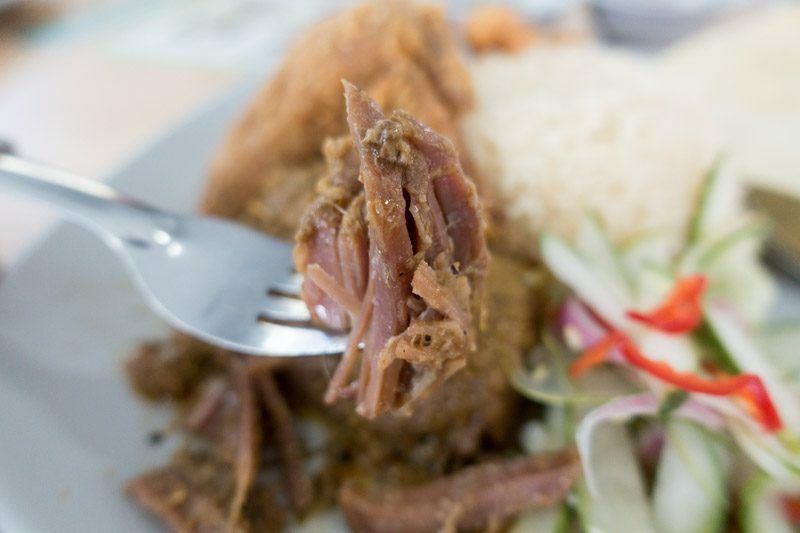 If you’re not already full from the massive plate of nasi beringin, you can get a side of Pandan Chicken (1 for S$1, 3 for S$2.50). Wrapped in pandan leaves, the chicken was more oily than fragrant, which was a tad disappointing. I liked that it packed a good amount of heat, though the Pandan Chicken felt like it was made with minced meat rather than whole chicken pieces. For a traditional Malay dish that has only just reached our shores, Fifty50 Empire certainly delivers a finger-licking yummy rendition. The nasi beringin is a fragrant and appetising dish that left me feeling satisfied but not overly full, and I thoroughly appreciated that it wasn’t too oily despite the amount of herbs and spices present in the meal. 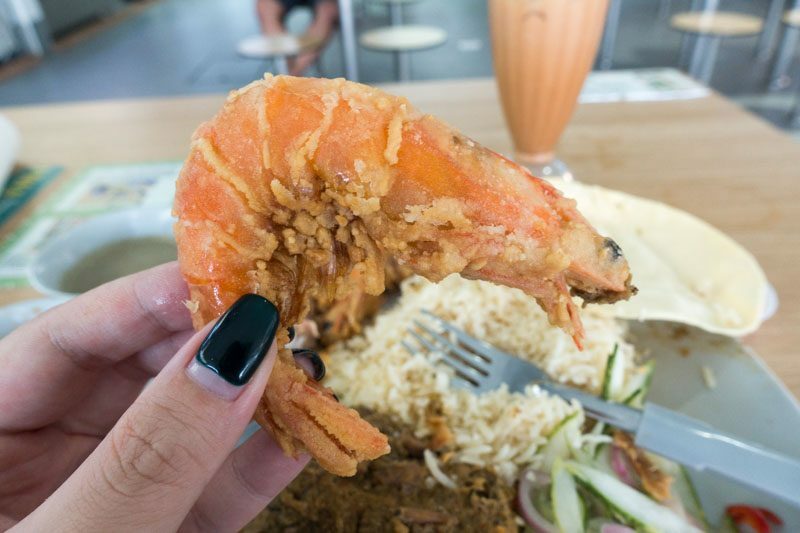 With prices going up to S$9 for a plate of aromatic rice and meat or seafood without any add-ons, I’d say this might be a little pricey for a hawker dish, but given its uniqueness and generous servings, it is worth the cost.